Release Date: October 10, 2014 – U.S. 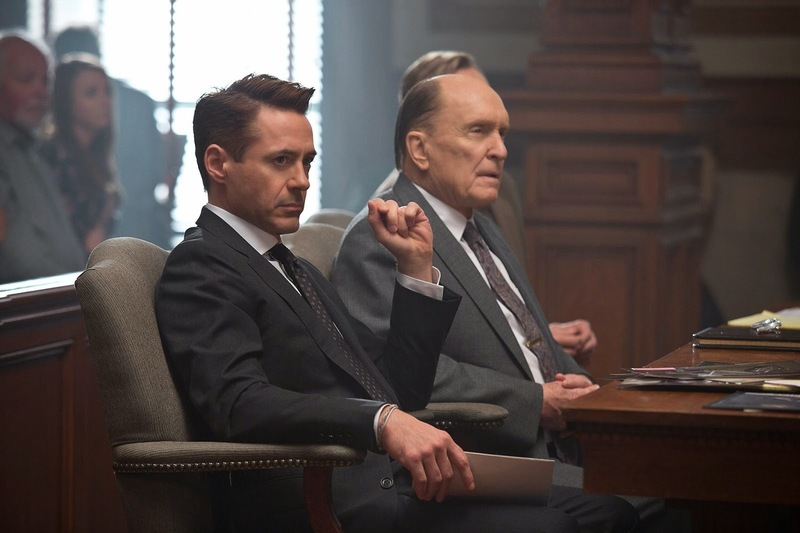 Watching Robert Downey Jr. and Robert Duvall – two absolute masters of the acting craft – go back and forth would be worth the price of admission alone, but "The Judge" is so much more than that. It's a genuinely great movie. At two hours and twenty-one minutes, it's a long movie too. It earns its length though. Despite its extended running time, it's tightly scripted. Every conversation, every line, means something and leads somewhere. That might be the most impressive feat of all. Hank Palmer (Downey Jr.) is a successful lawyer. He's also an unpleasant man – a trait he openly admits to and almost seems to take pride in. He hasn't seen his family in years, but when his mother dies, he's finally forced to go back home. His very young daughter (Emma Tremblay) wonders if his father – her grandfather – is dead too. "Just dead to me," he explains. Who speaks that way to a little girl? When we finally get to meet the judge, Joseph Palmer (Duvall), we can clearly see that the apple didn't fall far from the tree. The elder Palmer isn't exactly "unpleasant" like his son, but he is stubborn and has a definite sense of right and wrong. There's no arguing with this man when it comes to the law and the very best way to apply it. So, of course, he ends up being accused of murder. A local man, Mark Blackwell (Mark Kiely), is found rotting on the road. Judge Palmer's car has Blackwell's blood on it. The judge's possible motive: Blackwell came through his courtroom before, and it didn't end well. The judge always been self-righteous about the law, but would he take it into his own hands to get justice at any cost? The opposing counsel, Dwight Dickham (Billy Bob Thornton), is ready to argue just that. The elder Palmer initially hires a well-meaning but inexperienced local lawyer (Dax Shepard) instead of his own flesh and blood. But I don't think it's a spoiler to mention that the son will, of course, eventually have to step in and defend his estranged father in court – because that is, after all, the basic premise of "The Judge." The scenes between Downey and Shepard are some of the best and funniest in the film. Instead of the adversarial relationship you would expect from their characters, there's almost a sweetness to their scenes as the more experienced Downey gives Shepard tips on how to handle stress before a big case. The cast, as you can see, is tremendous – and I haven't even gotten to some of the main players yet. There are two more members of the Palmer family, Glen and Dale (played by Vincent D'Onofrio and Jeremy Strong, respectively), who are Hank's brothers and the judge's sons. Glen is old, disheveled, and rough around the edges, but he's generally a good guy. When we first see Dale, it's at a funeral home – and he's holding a camera, which seems incredibly inappropriate. I was under the impression that he was a rude reporter who had pushed his way in – until Hank gives him a big hug. As it turns out, Dale has a mental impairment of some sort – or possibly a form of autism – but it's never really specified. In any other movie, a character with a "disability" would be treated like the second coming of Baby Jesus – someone who can say and do no wrong – but that's thankfully not the case here. To this film's credit, Dale's family reacts realistically to him. For example, during one tense moment, Glen dismissively comments on Dale's obsession with video cameras by telling him to "film the vending machine." Hank – Downey's character – also runs into an old friend, Samantha (Vera Farmiga), whose prominent tattoo seems to hint at a wilder past. At first, I found it almost jarring that a prim, proper, uptight lawyer like Hank would ever associate with the tattooed girl from the diner. But that's what makes "The Judge's" script so smart – even the smallest details, such as a tattoo, tell a larger story. The acting is amazing all around, but this is primarily a showcase for Robert Downey Jr. and Robert Duvall. Both of them wholeheartedly deserve Oscar nominations – and it wouldn't surprise me if Duvall, at least, ends up with one. Their best scene together – in a bathroom – is unimaginably tragic, but it also manages to be hysterically funny at the same time. Life is often like that. In lesser hands, a moment of that magnitude would be almost impossible to pull off. Old pros like Downey and Duvall make it look easy. The title of "The Judge" refers literally to Duvall's Judge Joseph Palmer, but it also signifies every other character in some way – because they're all judging and being judged for something. My judgment: This is one of the best films of the year. If you go into the theater expecting a fast-paced and thrilling episode of "Law & Order" on steroids, you won't get that. The courtroom scenes are exciting and nerve-wracking, certainly, but "The Judge" is about more than just a case. It's about a father and son, a family, a town, a past, what it means to come from something, and why it's important to remember and hold on to what matters most.